He was speaking at passing out parade held at the Pakistan Military Academy Kakul. Cadets of 139th PMA Long Course, 9th Mujahid Course, 58th Integrated Course and 14th Lady Cadet Course passed out on completion of training. Cadets from Saudi Arabia and Sri Lanka were also among the passing out courses. The president said while armed forces' operational preparedness and befitting response defeated the nefarious designs of the enemy, it also amplifies Pakistan's sincere intentions for peace and relationship based on sovereign equality and mutual respect with its neighbours. He said Pakistan has been and will always remain promoter of peace as part of its national policy. However, he said there should be no doubt that any misadventure and even the slightest breach of national security will get a befitting response and no sacrifice will be considered too great in accomplishing this sacred cause. Alvi particularly mentioned that Pakistan is a global participant in combating the menace of terrorism and will continue to play this role with due national resolve. He also reaffirmed the commitment that Pakistan will continue to stand by the Kashmiri brethren in their legitimate struggle and the right to self-determination. "While we continue our political efforts to find the solution of this conflict and we will leave no stone unturned in exposing the perpetrators, suppressors of the innocent Kashmiris. I urge the world powers to take stock of the plight the of the Kashmiri people in the light of the resolutions of the United Nations Security Council," he maintained. The president asked the world community to act against blatant violation of human rights in Indian Held Kashmir. Alvi observed that the challenges and complexities faced by Pakistan are immense and are ever growing in nature. “However, the success that we have achieved as a nation against the scourge of terrorism has no parallel in the contemporary world,” he said. 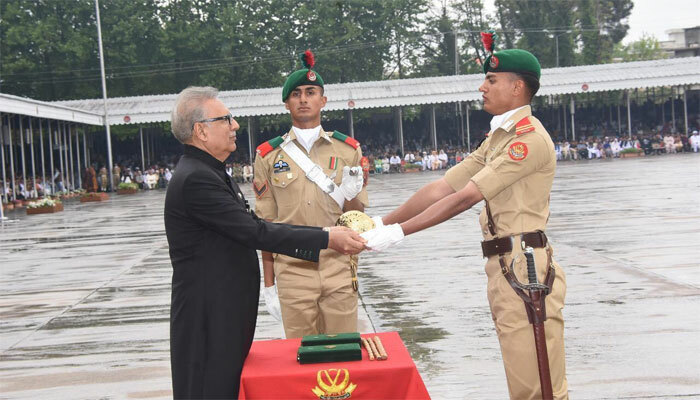 President Arif Alvi congratulated the passing out cadets and their families and said, “You will be leading some of the best trained, motivated and battle-hardened soldiers in the world. Bear in mind that your nation reposes great trust in you and it must be maintained by achieving high standard of professional excellence." He was confident that the armed forces today are highly motivated, battle-hardened, and fully aware of the multitude of the threats to the beloved country. The president reviewed the parade and gave awards to the distinguished cadets. The Sword of Honour was awarded to Academy Senior Under Officer Haider Ali Khan. President's Gold Medal was awarded to Battalion Senior Under Officer Muhammad Umar Khan. The Commandant’s Cane awarded to two cadets, Course Under Officer Muhammad Shahzad from Mujahid Course and Course Under Officer Ahmed Bilal from the Integrated Course. The Chairman Joint Chiefs of Staff Committee Overseas Gold Medal was awarded to friendly country's Under Officer Abryrathns from Sri Lanka. The Commandant’s cane was awarded to Course Under Officer Ayesha Shakeel from the Lady Cadet Course. A large number of senior serving and retired military officials, diplomats and relatives of the passed out cadets witnessed the parade.